Sales of vehicles to commercial, daily rental, and government fleets declined 13.1% to 279,063 in March and remain negative for the first quarter in the three segments, according to Automotive Fleet data and the Detroit Three. Across the three fleet segments, sales of trucks, vans and SUVs declined 7.8% to 170,843 vehicles, while sales of passenger cars fell 20.2% to 108,220. Sales of vehicles from eight manufacturers to commercial fleets declined 10.9% to 65,701 compared to the same month in 2016, and year-to-date sales have fallen 6.3%, according to Automotive Fleet data. Truck-based sales to commercial buyers lost 7.1% of ground to 56,514, while passenger car sales declined 28.8% to 9,187 units. For the first quarter, sales have fallen to 168,290. Truck-based sales have fell 4.1% to 143,722 compared to the first quarter of 2016. Car sales in the period declined 17.4% to 24,568. Daily rental sales declined 14.1% to 188,062. Truck-based sales fell 8.1% to 93,214, while car sales fell 19.3% to 94,848. In the quarter, truck-based sales declined 1.8% to 261,531, while car sales declined 18.1% to 243,272. Government fleet sales saw similar results with a 10.4% decline to 25,300 units in March. Truck-based sales fell 8.4% to 21,115, while car sales declined 19.4% to 4,185. For the first quarter, sales have fallen 9.6% to 62,370. Truck-based sales fell 5.8% to 52,013 in that period, while car sales have declined 24.8% to 10,357. Among the Detroit Three, General Motors and Fiat-Chrysler reported an increase in commercial fleet sales, while Ford reported a downdraft. General Motors increased commercial deliveries 3% with a 67% increase in deliveries of the Chevrolet Malibu with strong pickup and full-size van sales. Daily rental sales fell 18%. Overall fleet sales fell 9%, including sales to government agencies. Overall, General Motors sold 256,224 vehicles in March. Ford reported a 16.9% decline in fleet sales with 78,510 units. The performance was an improvement over March of a year ago, because customer orders were front-loaded in early 2016, Ford noted. 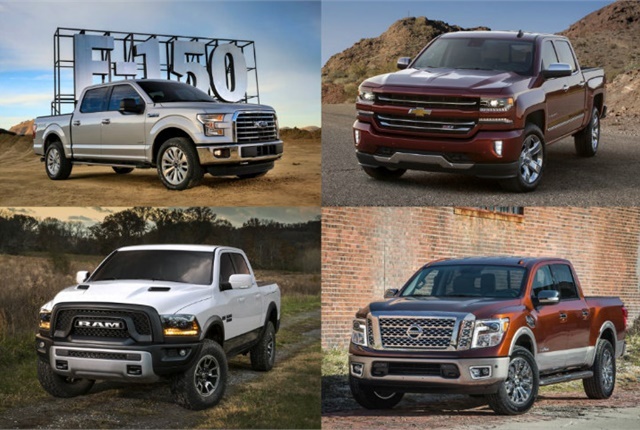 Sales of F-Series trucks to retail and commercial buyers reached 81,330 units, a 10% increase from a year ago. The average transaction price increased more than $2,500. High Super Duty trim grades, including the Lariat, King Ranch, and Platinum, represented 56% of Super Duty retail sales. Overall, Ford sold 236,250 vehicles in March. Sales of the Transit full-size van fell 18.3% to 12,167, while sales of the Transit Connect compact van declined 23.7% to 2,760. Transit sales were off 15.9% to 30,283 in the first quarter. Ford's patrol vehicles showed varying results, as sales of the Police Interceptor Utility increased 13.7% to 3,192, while sales of the Police Interceptor sedan fell 33.6% to 611. For the quarter, P.I. Utility sales increased 7.6% to 8,099, while sedan sales fell 19.4% to 1,834. Fiat-Chrysler's fleet sales declined 15% to 43,992 in March as the company continued to reduce its allocation for daily rental, according to the company. Fleet sales made up 23% of FCA sales. Overall, FCA sold 190,254 vehicles in March. Sales of Ram Truck brand vehicles increased 6% and Ram pickup sales increased 6% from a year ago. Sales of the ProMaster full-size van increased 24% to 4,048, while sales of the ProMaster City compact van declined 30% to 1,317.